A great way to honor the memory of your loved on is to incorporate something of theirs into you wedding day. We’ve seen brides wear their loved ones jewelry or grooms sport a passed relatives tie. Sometimes having an item of your loved one there can give you the comfort of knowing they were in a way present for your event. Photo tables are a great way to incorporate family past and present. 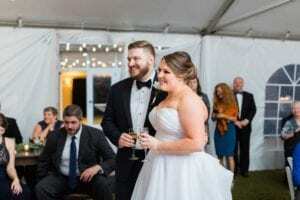 It is fun for guests to be able to look back and physically see the people who meant to the most to you and an even better way to remember them during your event. Toasts are a time honored tradition at a wedding. It is a time to reflect on memories and share in the moment with all of your guests. 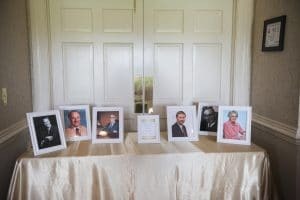 Why not have guests toast to the honor of a passed loved on and acknowledge how much they meant to you. How you decide to honor your loved ones is a personal decision. But sharing the people who meant so much to you during your big day is something that will make your wedding more whole and complete. Want more tips on how to make your wedding day uniquely you? Contact Magnificent Moments Weddings today, we would love to help you plan your perfect day.